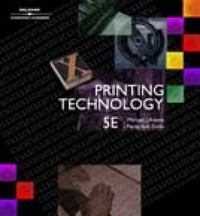 Printing Technology 5 Edition Printing Technology takes readers on a journey from the beginnings of the graphic arts industry through today's cutting-edge digital technology. Now in its fifth edition, this popular book has been reorganized to provide readers with a firmer grasp of how digital printing technologies are revolutionizing the industry. Traditional analog printing methods are reviewed in the first six chapters, establishing the foundation from which readers will develop an understanding of the state-of-the-art technological infrastructure for digital publishing that supports today's new, digital workflow. Subsequent chapters lead readers through the complexities of digital data, digital prepress operations, printing techniques, and finishing options. Since technology has also impacted the way business is conducted today, this edition also features information on computer estimating and job tracking, plus use of the internet as a portal for connecting printing facilities with customers, vendors, and suppliers. Discussion of customer-defined quality management, including introductions to total quality management (TQM) and statistical process control (SPC) techniques, is also included in the final chapter to ensure long-term success in this highly technical, fast-changing, and increasingly competitive field.